Once something to sip with trepidation, coffee has exploded onto the scene as a beverage people can feel good about drinking. A few decades ago, American coffee was a relatively uninspiring beverage. A cup of joe at a local coffee shop never seemed to get much richer in color or flavor than dirty water, so it's no wonder people didn't celebrate the drink. In addition, healthcare professionals commonly dispensed cautionary advice about its consumption. But now, coffee has officially crossed over into new territory. Good-quality coffee—the kind you might find in a French or Italian café—is now the standard. There seems to be a Starbucks on every corner, and it is commonplace to see people toting trademark coffeehouse cups. The coffee-guzzling trend dips into all demographics—from the college set and new agers to urban professionals and baby boomers. While the current coffee craze was sparked by the emergence of flavorful, high-quality gourmet varieties, a slew of studies suggesting that coffee's associated health concerns may be unfounded has also nurtured it. In fact, coffee may offer certain health benefits. “When I first started working on coffee research in the 1950s, I was one of the earliest people in the science field to work on coffee. And at that time, the industry often had to defend itself because coffee was thought to be responsible for a laundry list of diseases, but there was no real scientific data to support that. From the late ’70s up to about 15 years ago, that was the story on coffee. Then the pendulum began to swing the other way,” says Stanley Segall, PhD, professor emeritus of the nutrition and food sciences department at Drexel University in Philadelphia and an Institute of Food Technologists communicator. It’s good that scientists are discovering no real health threats associated with coffee consumption because Americans sure do love their java. According to the National Coffee Association of USA, Inc, this country’s coffee consumption continues to increase, with consumers becoming more educated about different coffee varieties and demanding quality. The 2008 National Coffee Drinking Trends Study found that in 2007, past-day consumption of coffee surpassed that of soft drinks for the first time, and daily consumption of coffee is still higher. Seventeen percent of the adult population consumed a gourmet beverage on a daily basis in 2008 compared with 14% in 2007. Adults aged 25 to 59 led the upswing, representing 19% of daily gourmet coffee drinkers, an increase of six percentage points from 2007. Consumption of cups per day by consumers aged 18 to 24 continued to be higher in 2008, with an average of 3.2 cups per day compared with 3.1 in 2007 and 2.5 in 2005. “Consumers are connecting with coffee, which is now being produced at higher levels all over the country. There are more and more people interested in searching out the best coffees. Coffee is a big part of a lot of people’s lives, no matter whether they are a blue collar worker or make $200,000 per year. People enjoy this routine part of their day. People enjoy coffee, whether it’s drinking coffee in groups or drinking it at home. Coffeehouses allow an interesting, diverse group of people to connect with each other. You can have an alternative, young person on the couch next to an older, conservative person, and coffee brings them together to form friendships,” says Jared Mockli, consultant and lead instructor at The American Barista & Coffee School in Portland, Ore.
Environmental and trade issues are also major concerns for today’s coffee consumers. “Sustainable and fair trade is a big issue on consumers’ radar. The industry is very conscious about this. A lot of roasters or brokers work directly with the farm. It doesn’t have to be labeled ‘fair trade’ anymore to be from a responsible origin. If it’s not on the label, you can look into the roaster you’re getting coffee from,” says Mockli. A number of terms are turning up on coffee labels. Fair trade-certified coffee guarantees that the farmers who grew the coffee beans were paid a fair price and that guidelines for environmental sustainability and prohibition of the most harmful pesticides were followed. Organic coffee is grown without exposure to hazardous pesticides, and shade grown refers to coffee that must be grown beneath existing trees and use less synthetic fertilizer, herbicides, and pesticides, thus protecting the native forest and its habitat. Another hot trend in the coffee world follows the roasting process itself. “The source of the roasting is important to consumers. It’s amazing how many great coffee roasters are out there now,” says Mockli. It turns out that a major factor behind the perfect cup of coffee lies in high-quality coffee as freshly roasted as possible. On conventional supermarket shelves, the roasting date is usually a mystery, but plenty of award-winning coffee roasters across the country are delivering high-quality coffees freshly roasted on site. Coffee roaster Intelligentsia, with locations in Chicago and Los Angeles, buys the best raw, green coffee beans possible directly from importers and growers. Then they roast the coffee beans daily in vintage German roasters, bringing about a caramelized, aromatic state of perfection. Customers can drink a cup of freshly roasted coffee in the shop or take away coffee beans for home-brewed coffee bliss. Some stores such as Whole Foods Market are promoting freshly roasted coffee beans as well. Has coffee suffered from the economic downturn? 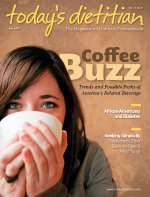 The National Coffee Association of USA reports that only time will tell how the credit crunch and rising prices in foodservice will affect coffee. In 2007, rising coffee prices tended to promote at-home coffee consumption. It seems that in tough times, people cut back on their daily coffeehouse habit. On July 1, 2008, Starbucks announced it was closing 600 underperforming, company-owned stores and cutting U.S. expansion plans. On January 28 of this year, the company announced the closure of an additional 300 underperforming stores and the elimination of 7,000 positions. But Mockli believes that coffee itself is poised to ride the recession. “Coffee traditionally has been consumed when the economy takes a dive. The economy does have its effects on coffee. Some have chosen to make the switch to some of the more inexpensive items on the menu such as lattes or brewed coffee. There are also more people drinking coffee at home now, as they’re scaling back a bit,” he says. Over the past several years, scores of studies have investigated coffee and its potential health benefits, looking at everything from dental caries to stroke. While many areas of coffee research have barely scratched the surface, others show a degree of promise. “There have been more than 15 cohort studies from around the world, all pointing out that regular coffee consumption is linked with a decreased rate of type 2 diabetes. Coffee may have beneficial effects by slowing the absorption of carbohydrates in the intestines,” adds van Dam. Coffee consumption has also been linked to a lower risk of liver cancer, according to van Dam. A 2007 Hepatology meta-analysis of studies on hepatocellular carcinoma and coffee consumption retrieved 10 studies (six case control and four cohort) for analysis. The researchers found evidence that the inverse relation between coffee and hepatocellular carcinoma is real. Segall believes that there is still not enough evidence available to understand the relationship between hepatocellular carcinoma and coffee consumption. At this time, the coffee mechanism and dose involved in liver cancer are unclear. “The caffeine effects of coffee are quite real; it helps people stay alert, focus, and feel a good boost,” notes Segall. But when it comes to other areas of coffee health research, he’s more guarded. “Other studies have found reported benefits on a variety of conditions,” he says. The disease list includes gallstones, Parkinson’s disease, prostate cancer, cognitive function, migraines, and endurance. “There is not enough scientific evidence to support any actual health benefits in these areas at this point,” he says. Another valid coffee consideration is that it is a very low-calorie beverage that has been enjoyed in social and cultural settings for centuries. It’s interesting that scientists are discovering that traditional and cultural plant-based beverages such as tea and coffee are turning out to have some potential benefits. “I wouldn’t tell people to drink coffee if they don’t like it, but it can be a healthy beverage. It is very low in calorie content, which is important because people often drink high-calorie beverages in the U.S.,” says van Dam. But keep in mind that today’s coffee drinks often bear little resemblance to the simple brews that were once sipped. Mountainous, whipped-up coffee beverages can contain close to 700 calories per serving, as well as ample amounts of saturated fat and sugar. There aren’t many health advantages in beverages like those. The headlines on studies may have influenced the public’s image of coffee. It seems that coffee drinkers are feeling more confident about the health benefits they may find in their favorite brew. The 2008 National Coffee Drinking Trends Study found that coffee drinkers are more likely to feel that it’s healthy—49% compared with 36% of nondrinkers. Sixty one percent said that coffee improves their mental focus vs. 48% of nondrinkers, and 59% of coffee drinkers said they are more productive vs. 47% of nondrinkers. Scientists also stress that relying on a variety of plant foods for antioxidant intake is the preferred route, as people can gain the benefits of a host of vitamins, minerals, fiber, and phytochemicals. And let’s not forget that caffeine and coffee consumption may not be the best prescription for everyone. It may aggravate conditions such as gastroesophageal reflux disease, migraines, arrhythmias, sleep disturbance, and benign fibrocystic breast disease. We may have much to learn about how coffee can affect health, but it does appear that people can now sit back and enjoy a cup of coffee without the guilt. Segall reminds us that while coffee doesn’t seem to have negative effects linked to the development of chronic disease, it’s not a health food either. 1. Start with high-quality coffee beans. Try single-origin coffees, discovering subtle differences in taste profiles. Get to know your favorite coffee regions and microclimates, or try a blend that the roaster artfully put together to create superb balance and complexity. Learn about coffee-growing practices and cultivation and support sustainability and direct trade. 2. Use freshly roasted coffee beans. Discover a local retailer or roaster that can provide information about when the coffee was roasted. If it’s inconvenient for you to go to a coffee roaster, talk to your favorite coffeehouse about roasting procedures and dates. Try to use coffee within one to two weeks of the roasting date. 3. Rely on whole coffee beans and grind them fresh for each pot according to the brewing method being used. A variety of good coffee grinders are available to consumers at many price points. 4. Keep your coffee equipment clean. From the grinder to the coffee maker, make sure to routinely clean equipment to preserve the flavor profile of coffee. 5. Use a coffee maker that doesn’t “cook” the coffee. Coffee makers with a hot plate will continue to heat the coffee, thus destroying its flavor profile. Coffee systems such as a French press do not rely on hot plates, but the coffee can cool quickly. Use a thermal carafe to keep the coffee hot without destroying its taste. 6. Savor the simple flavors of amazing coffee, without the addition of highly flavored syrups and creams. Less is more.